El Caribe - A private luxury getaway with stunning views and Caribbean details where the view blows the pristine scenery into every room. El Caribe is a newly renovated villa brand new to the rental market. 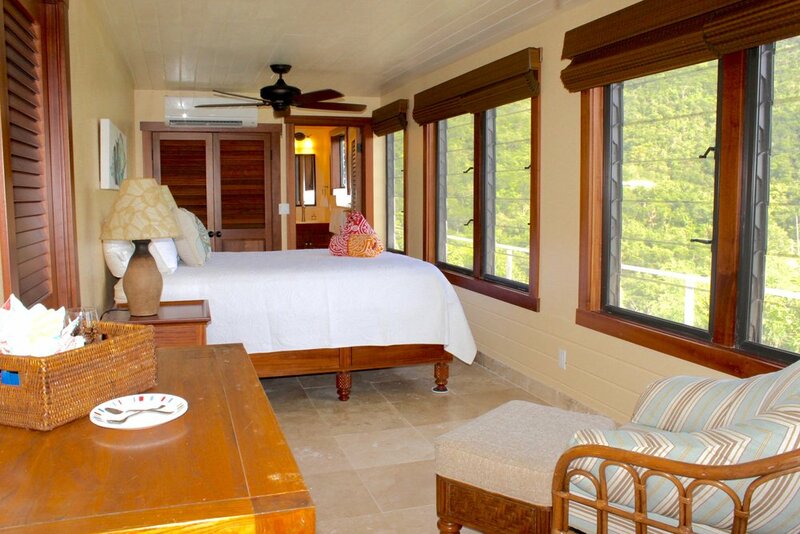 This bright and airy, mahogany trimmed Caribbean villa is the ideal retreat for couples and small families. 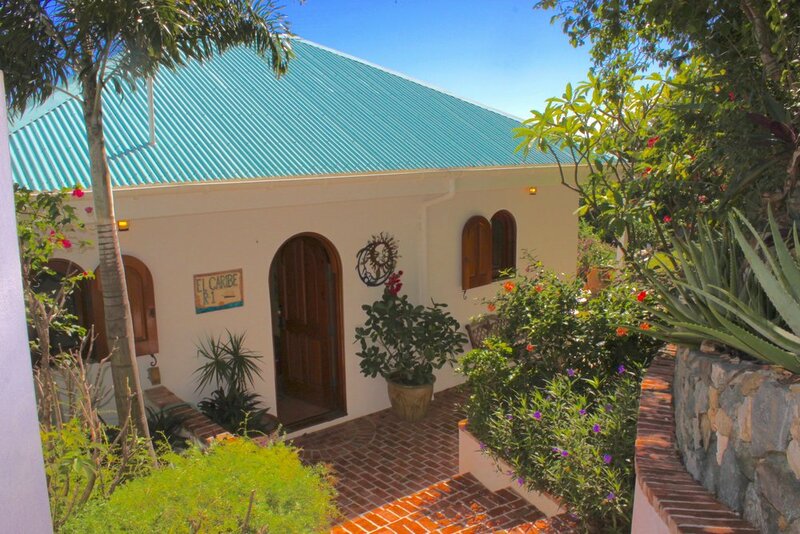 Surrounded by National Park and end of the road location, but still just 15 minutes from Cruz Bay and the beautiful beaches and trails in the Virgin Islands National Park make this villa the ideal private getaway. AC in a very spacious bedroom, full cooks kitchen, stunning bathroom, detailed woodwork, full amenities, professional housekeeping and property management and views from every room. 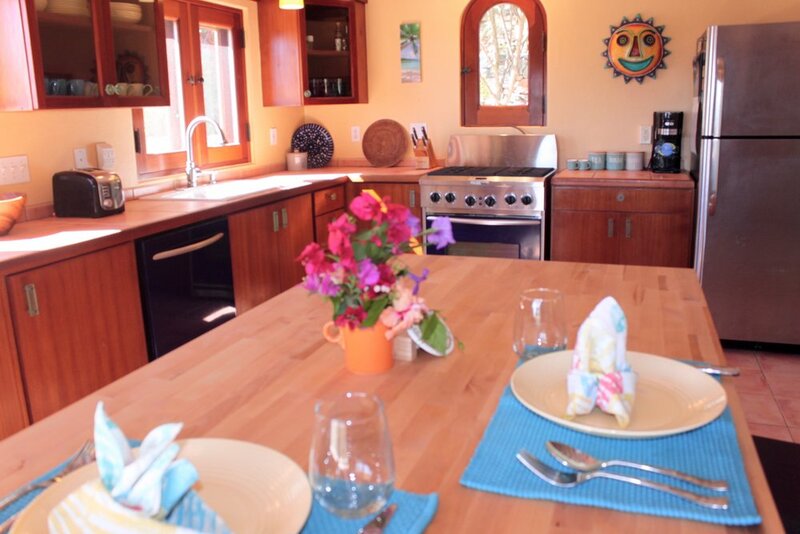 This charming, cozy villa has an open concept Great Room that encompasses a fully equipped spacious kitchen with an island and seating for four people. The kitchen overlooks comfortable seating in the living area with HDTV, inside a custom mahogany wall unit. Cable TV, DVD and high speed wireless Internet is all included. There are three 60 inch Emerson ceiling fans that circulate beautiful cross breezes throughout the villa great room which accompany the fresh tradewinds. The main floor living space also includes a bathroom with an outdoor shower and a queen pull out couch for extra guests or kids. All of the cabinetry and armoires have been custom crafted in mahogany. Sliding doors off the kitchen and the living room open to a covered, private deck that wraps around three sides of the villa. 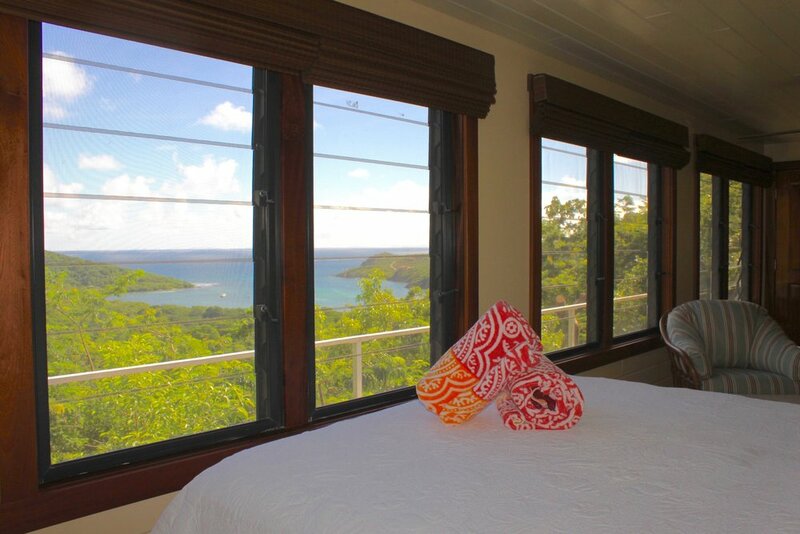 El Caribe boasts wonderful breezes day and night and a lovely view of Fish Bay and the Caribbean beyond. We also have a teak table outside on the patio, a brand new Weber BBQ and lots of comfortable seating and lounge chairs on the deck. You will be delighted with the new living space downstairs, accessed from the outside deck. 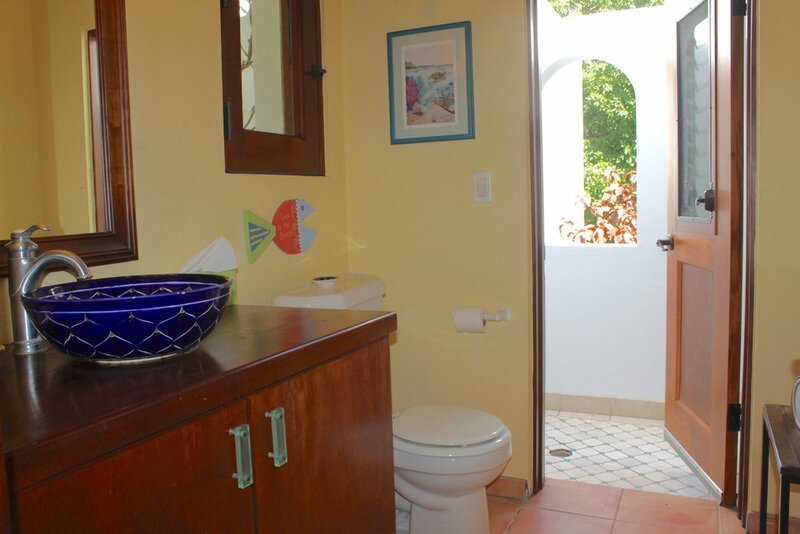 It encompasses a very large master bedroom, and a spacious bathroom with double sinks and a custom shower made of coral from the ancient mountains of Puerto Rico. There is a guest closet and drawer space, two more 50 inch ceiling fans and a lovely additional alcove which is a perfect space for a baby. The space is cooled by ultra quiet, state-of-the-art air conditioning. El Caribe is nicely appointed with plenty of attention to detail. There is also a new ultra-violet water filtration system, so the water is safe to drink.